The action is slim here as a frustrated Mayne, stymied in his efforts to conceive a strategy to save Old Earth from its overwhelming foe, the Others, visits the secretive, quasi-religious Chantry Guild on the planet Kultis. While absorbing their teaching, he helps the Guild evade local soldiers and has an unexpected meeting with his nemesis, Bleys Ahrens. 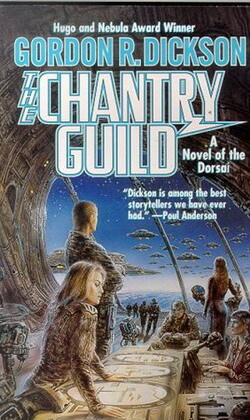 Although the protagonist's quest and Dickson's conviction are generally engrossing, the novel suffers from many of the pitfalls of Dickson's other solemn, parable-like tales. In its weaker moments, the prose teeters toward psychobabble as bland superman Mayne pushes a reluctant human race toward a level where they would have more, be more, and choose more wisely.